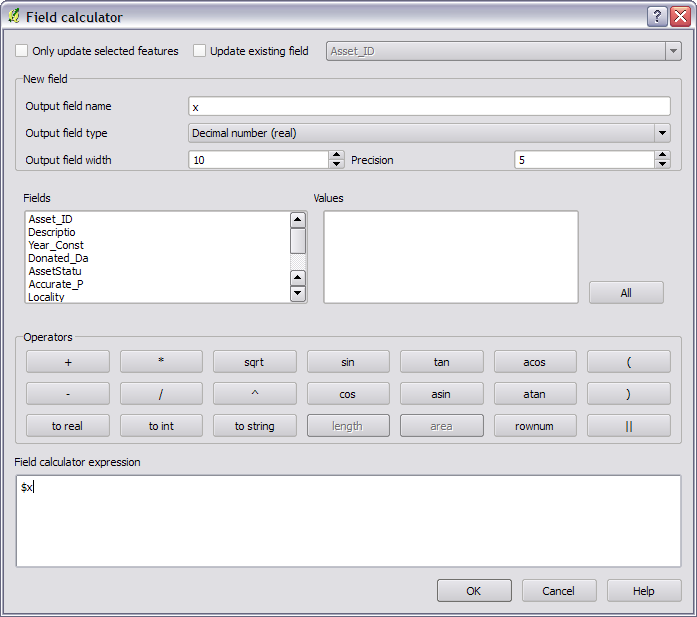 I'm trying to figure out how to calculate the lat/long of points using the QGIS field calculator. Is there an easy way to do this? I saw a previous related question, but it deals with a more advanced approach. In ArcGIS this is similar to the Calculate Geometry function; I just can't find where do this in QGIS. Sure can. First, save the layer as WGS84 and import it again. Then in the field calculator you can use $x or $y as a variable to get the x and y. NOTE: This was added in 1.7. You have to reproject the point layer to EPSG:4326 first. Right-click on the layer name in layer list and select "Save as ...". There, you can specify the target CRS to be EPSG:4326. Load the new reprojected point layer and then run "Export/Add Geometry Columns". One option could be specifying the layer CRS as WGS 84(no projection). May be you will have to change the project CRS too. Now use "Vector > Geometry Tools > Export/Add Geometry Columns". This should give you Lat/long coordinates. The previous best answer can be considered obsolete. Using the field calculator, you can get x, y coordinates from points layer in any projection and make the conversion to longitude latitude. You can find the recipe, documented with formulas and an illustrated GIF. For user like me, after 7+ years, there is a better and simple answer. 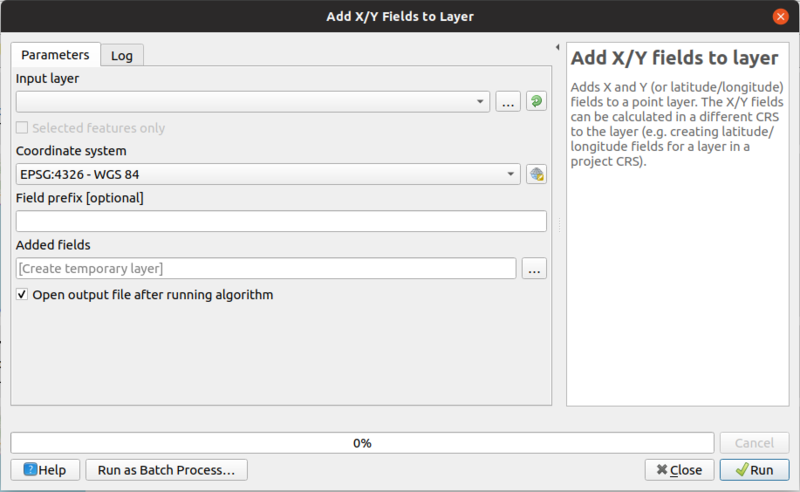 In QGIS 3.8 (June 2019), there is now an algorithm to add the X and Y values. It can reproject coordinates on the fly. If you still need a Degree Minute or Degree Minute Second format, you need to use first the to_dm or to_dms expression to add these fields into the attribute table. QGIS: How to store the GPS coordinates in the attribute table? Using Qgis API and python, how can I return latitude and longitude of a point? How do I convert ESRI X,Y to Lat, Long for Google Maps? How to split geometry collection into its items using Python and QGIS API? How to write a expression in field calculator for finding $X and $Y? How to calculate x/y in a different coordinate system in QGIS 2.4?